We’ve covered a few ways to change Lion (s aapl) to behave a bit more like its predecessor, but what about some shortcuts for quickly accessing some of Lion’s new features? With all the focus on new multitouch gestures, the keyboard is getting a little left out. 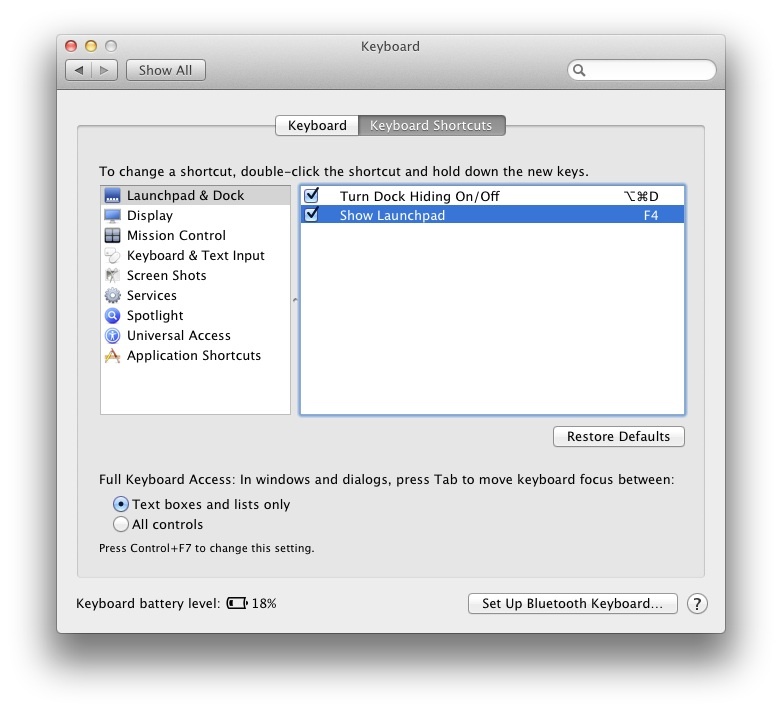 Here are three tips to help navigate around Lion more quickly using the keyboard instead of the mouse (or trackpad). It’s easy to switch spaces using a swipe or Mission Control, but that involves moving away from the keyboard. 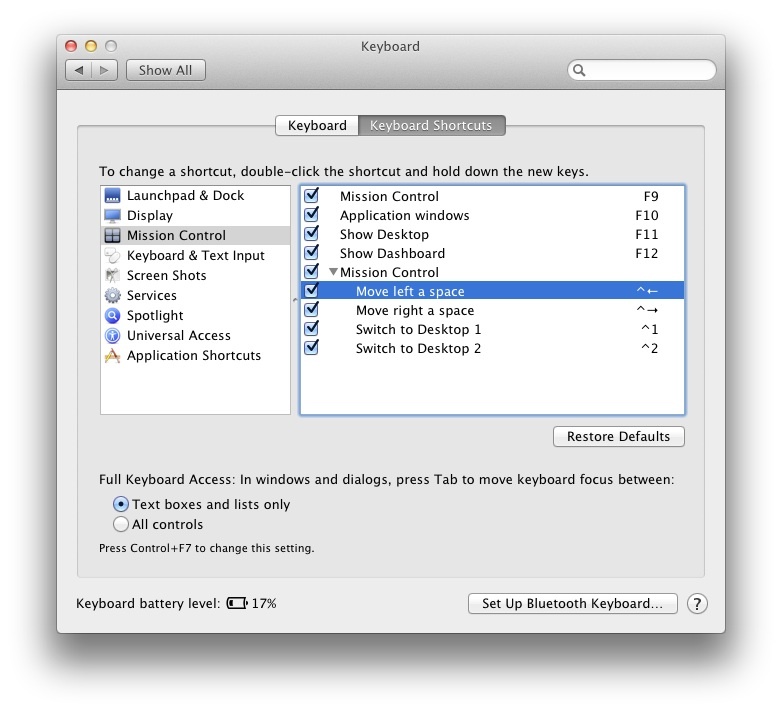 There is a shortcut you can turn on in System Preferences to enable switching spaces using the keyboard. Open up System Preferences, either from the ? menu or the Applications folder, and open the Keyboard pane by clicking its icon. In the Keyboard pane, switch to the Keyboard Shortcuts tab to manage keyboard shortcuts. Find Mission Control in the list on the left and click it to show the shortcuts available for Mission Control. In the list on the right should be two entries, one labeled “Move left a space” and one labeled “Move right a space.” In order to enable these shortcuts, check the checkbox to the left of their names if it isn’t already checked. The default keyboard shortcuts are Control–left arrow and Control–right arrow, respectively. You can change these by double-clicking the symbol on the right of the row and typing a new shortcut. You can now use the shortcut you selected to navigate between spaces and full-screen apps. If you want to switch between a full-screen app and a regular desktop space, you can switch left and right using a gesture or the above shortcut. But what about if you have seven or eight full-screen apps open and you don’t want to swipe through all of them? In the same section of System Preferences as before, you should see more shortcuts labeled “Switch to Desktop 1,” “Switch to Desktop 2” and so on, depending on the number of spaces you have enabled. You can use these shortcuts to jump straight to a normal space from any application, full-screen or otherwise. Just set them up however you would like (the default is Control and a number key), and then you’ll be able to avoid swiping across a bunch of screens. In Lion, Dashboard is given its own space, which is easily opened with a swipe. That means that the Dashboard key on the keyboard (F4) is not really necessary. Why not remap the Dashboard key to open Launchpad instead? That’s how new shipping keyboards and Macs work anyway. 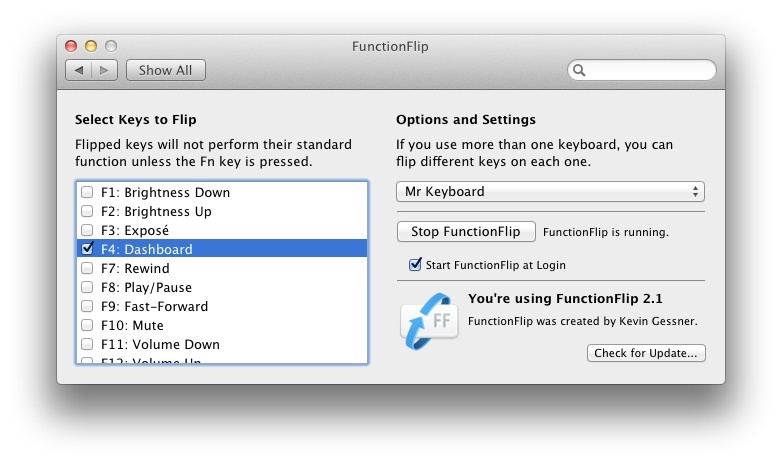 You’ll need to download a copy of FunctionFlip (free), which allows you to disable the special functions of the function keys (F1, F2, etc.) individually. Once you have FunctionFlip installed, open its settings in System Preferences, which will be listed at the bottom, under Other. In the drop-down list on the right, select the keyboard you’d like to change the setting for. You can always do this for every keyboard in turn. Find the entry for Dashboard in the left-hand panel. It should be the fourth item from the top. Check the box to the left of it to disable the Dashboard function of the F4 key. Now go back to the Keyboard Shortcuts tab of the Keyboard pane and find Launchpad & Dock in the list on the left. In the list on the right, select Show Launchpad on the right-hand side. Double-click to the right of the selected row to edit the shortcut, then press F4 on your keyboard to set the shortcut to F4. You should now be able to launch Launchpad using the Dashboard key, rather than a gesture or the mouse. Do you have any other time-saving Lion tips? Share them in the comments. I don’t see the need to install an extra tool (FunctionFlip). In Keyboard Shortcuts/Mission Control I assigned the Dashboard to CTRL-0. So it is even consistent with the other desktop shortcuts. BTT is awesome. Really awesome. It allows you to assign shortcuts for ANYTHING, add ANY gestures you want, and works ALMOST FLAWLESSLY. I only regret I haven’t installed it earlier. I think that Apple MUST buy it out or create something EXACTLY like BTT and it part of the OS. I used Better Touch Tool to get back the old 4 finger swipe to open the application switcher, which I like much better than the Lion way of doing things.